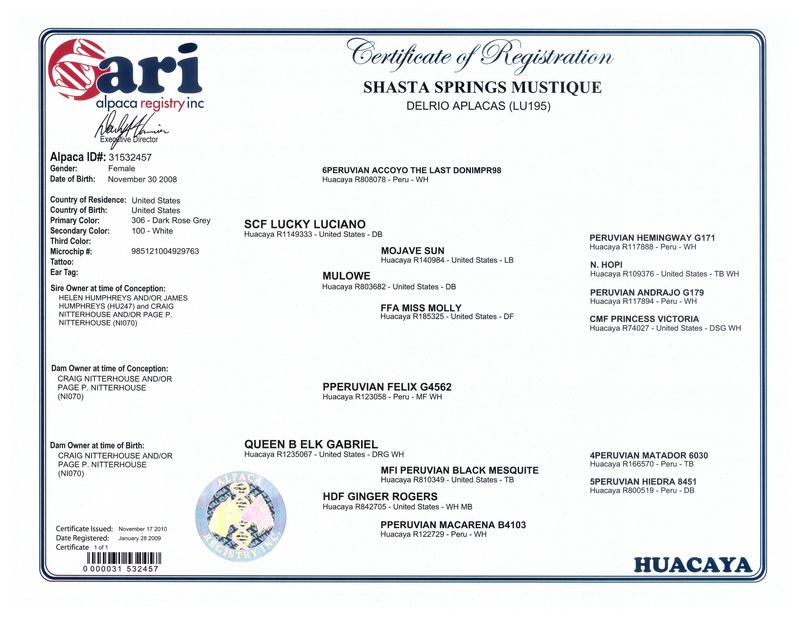 Silvercloud Farm proudly presents ScF Lucky Luciano. Lucky Luciano has his first crias due in Fall 2006 and we can't wait to see what this Four-Time Champion (and counting) herdsire puts on the ground! 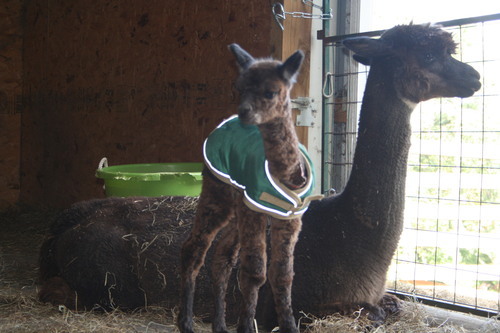 ScF Lucky Luciano is the fourth cria out of our "Grand Dam", Mulowe (a Hemingway granddaughter), and the first to share Mom's color of a Dark lustrous Brown. 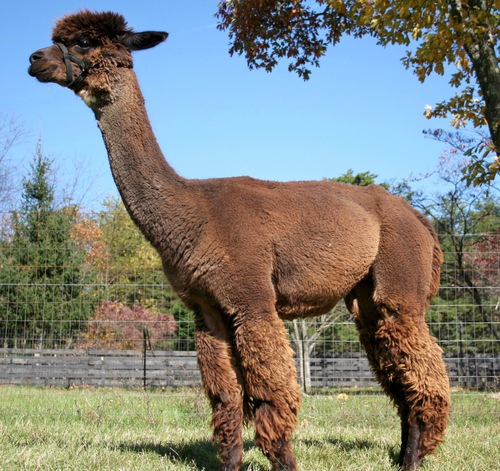 During his show career, Lucky Luciano won 4 COLOR CHAMPIONSHIPS, MAPACA 2005, The North American Alpaca Show 2005 & The Kentucky Classic 2005 as well as taking a Reserve Championship at PAOBA 2005 and a 1st Place at Buckeye 2005. Mike Safley, judging at the North American, said that his choice for Lucky Luciano for the Championship was a "No brainer" and immediately picked him from all of the first place males in the Brown class. ScF LUCKY LUCIANO is passing along the Champion genes to his crias. He has Multiple CHAMPION CRIA to his credit! Co-owned with Mike & Kelly Manning from Limestone Ridge Alpacas. Mustique, was the 2009 VAOBA Expo 1st Place Halter and Grey Fleece Champion. Her bloodlines are loaded with well-known names such as Hemingway, 6Peruvian Accoyo the Last Don, Felix and MFI Peruvian Black Mesquite. Her uniform fleece has a very tight crimp with a silky handle. 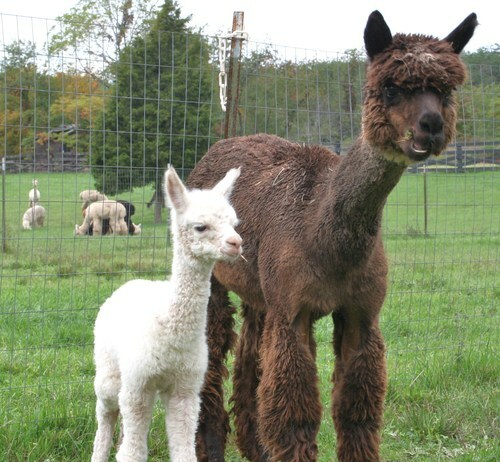 Her first cria was a gorgeous, pure white girl, Mysti, whose sire is MFI Peruvian Titan’s Clash. Mustique was bred again in the Spring of 2013 to Snowmass Arctic Blue out of Good Time Ridge Farm. Elvis is a future herdsire that we can't wait to show off. He is the same color as both parents, dark rose grey with a proud but mellow personality. Both Mom and son are boarding at Good Time Ridge Farm in Augusta, WV.